In Japan, in the springtime, the parks are dotted with blue tarps spread beneath ephemeral blossoms hanging in thick clusters from the cherry trees. Sitting on the tarps beneath the trees, eager squirrels running along the branches, or a brisk wind, will shower you with soft pale pink petals, a harbinger of spring and a reminder of the evanescent quality of life. The deep arch of this beautiful cherry tree near the old castle walls in Fukuoka, Japan, offers a perfect setting for cherry blossom viewing. 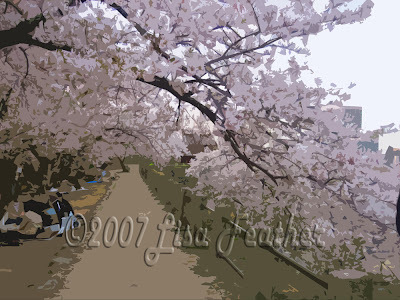 It is secluded from the din of city life suggested by the tall buildings that are faintly present just beyond the arch of the cherry blossoms, on the right edge of the picture. This setting offers a brief respite from the daily cares of a modern lifestyle.